Please be aware that as of August 1, 2018, Facebook will remove the ability for third party apps to post to personal Facebook Profiles on your behalf. 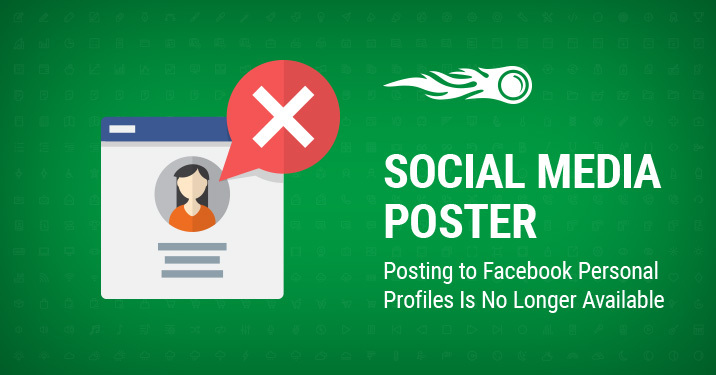 This change affects our Social Media Poster, which means that you will no longer be able to post to the Facebook Profiles you have previously connected. This will come into effect on July 25, 2018. The good news is that you will still be able to connect and post to Facebook Pages (business profiles), so if you were considering converting your Facebook Profile to a Page, now is the time! We fully support Facebook’s intent to discourage the misuse of personal accounts and believe it will have a positive effect on users, encouraging them to use SEMrush for their business rather than personal use. We apologize for any inconvenience this may cause and look forward to implementing these changes with minimum disturbance to your posting routine. If you have any questions about converting your personal profile to a business page, please email us at [email protected].